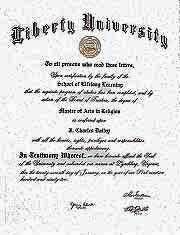 Following my departure from Minnehaha, I immediately jumped into earning a Master of Arts in Religion from Jerry Falwell's Liberty University in Lynchburg, Virginia. Liberty was, and probably still is, the largest of the Evangelical Christian Universities. The course at Liberty Baptist Theological Seminary (R. B. Lakin School of Religion) was designated as three years, but I determined to shorten that. I graduated by working non-stop for nine months. I transferred credits from Pacific Christian College and also successfully challenged one course on eschatology. I graduated with an emphasis in World Missions. The instruction was very good. They have excellent plans to grow churches. But quietly behind the growth was extreme division. There were more than sixty Baptist Churches in the Lynchburg phone directory, most of them out of fellowship with each other. In some cases, I could not even grasp the issues that divided them. One of my PhD instructors in the Graduate School said that he and his wife attended different Baptist churches. His teaching contract required that he attend Thomas Road Baptist Church and his wife refused to join him. It seems that advanced education had not solved the age-old problem of strife. I've decided not to take any more college classes. In reviewing, I been to my share of schools. I studied under the famed Dr. Paul Popenoe. a Catholic University to study Judiasm. It claims to be "the world’s largest distinctively Christian university." 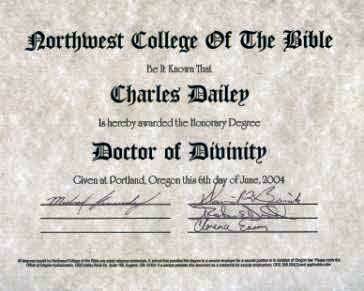 In June of 2004, I received an honorary doctorate from Northwest College of the Bible where I have taught since 1956.